How Many Handicap Parking Spaces do I need on my Parking lot? Parking accommodations for people with disabilities is mandatory for businesses to operate within the regulatory guidelines of their geographic location. Under the Americans with Disabilities Act, enacted in 1990, any form of discrimination against persons with disabilities is prohibited. What provisions of the ADA address parking accommodations for people with disabilities? The ADA Standards for Accessible Design requires all businesses offering goods or services for public consumption to remove barriers that make it more difficult for people with disabilities to use the facilities. The Act defines the number, size and orientation of designated parking spots for the disabled. Under ADA definitions, what kind of parking spaces should businesses dedicate for disabled parking? Parking spaces designated for the disabled should have an adjacent access aisle wide enough to allow a wheelchair or a wheelchair lift. The access aisle for car parking should be at least 60 inches in width while van-accessible parking should allow for a 96-inch access aisle. How many parking spaces should businesses allocate for disabled parking? The number of parking spaces will be a fixed percentage of the businesses’ total parking spaces, which is typically defined by local laws covering the type of business. A commercial concern with up to 25 parking spaces should designate at least one spot for disabled parking. In this case, providing a 96-inch access aisle would suffice for both car and van accessibility. 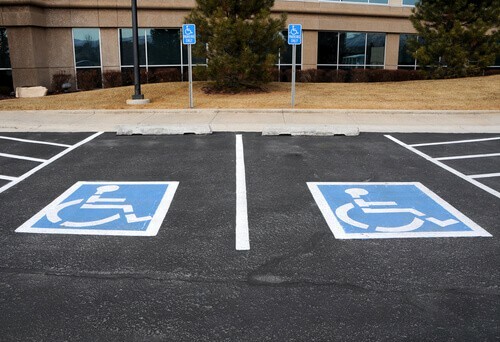 With 26 to 50 parking spaces, the minimum number of spots for disabled parking should be two with one each meeting the guidelines for car and van parking. When the total number of parking spaces is between 51 to 75, three spots should be reserved for disabled parking with two of those meeting van-accessibility guidelines. What other ADA requirements are relevant to disabled parking? ADA also requires businesses to locate reserved parking stalls as close to the building as possible and with wheelchair-accessible ramps. Parking spaces should be properly designated with the appropriate signage. How do businesses ensure compliance with ADA parking guidelines? 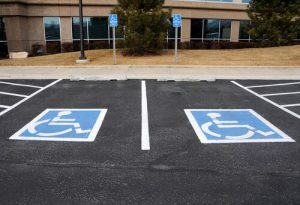 Businesses should work with experienced and qualified vendors who have knowledge of ADA-compliant parking lot design. Asphalt Pavement Solutions has been in the business since 1983, building a reputation for delivering quality work when it comes to parking lot restriping, asphalt repair, asphalt sealcoating and pavement maintenance. Reach us today at 1-800-559-SEAL or fill out our free quote form. We specialize in asphalt paving, asphalt repair, parking lot striping, and asphalt sealcoating —in Philadelphia throughout Pennsylvania, New Jersey, and Delaware.